ROGAINE Spring 2015 is postponed! – Extreme weather conditions – heat, dust, wind. – Large areas of terrain without shade. – Unmonitored competitors widely scattered throughout the area. Registration fees will not be charged to credit cards. The event will be rescheduled to take place in November/December 2015. Sincere apologies to everyone for the disappointment and inconvenience. and a 6-hour event for mountain bike riders. and on the ISOA website ROGAINE news page. Rogaining is the sport of long distance cross-country navigation, in which teams of two to five people visit as many checkpoints (“controls”) as possible within a set time period. The checkpoints are marked on a map given to competitors shortly before the start. Checkpoints have different point values, and can be visited in any order, so strategy and route selection are key elements to achieving the highest point score. Teamwork, endurance, competition and an appreciation for the natural environment are features of the sport. Traditional and championship rogaines are 24 hours in duration, but shorter rogaines are common. Learn more about rogaining. Rogaine Israel 2015 will span both the Adullam and British (Britannia) National Parks in the southern foothills of Jerusalem, south of Beit Shemesh. The western half of the map was part of the Rogaine 2013 Luzit map, while the Adullam eastern half has been newly mapped for the 2015 competition. The terrain includes forests as well as agricultural land with both cultivated and grazing fields, orchards, and vineyards, and is covered by an extensive network of trails. Several small rural villages are also located within the map. Rogaining is a team activity for people of all ages and levels of fitness. Rogaining appeals to all types of outdoor sports enthusiasts – from recreational hikers and bikers, to elite level orienteers, runners, mountain-bikers, and ultra-athletes. Your challenge and success come from your ability to read the map, to plan a route through as many checkpoints as possible, and to navigate your course within the time limit. New rogainers are always welcome and organizers are more than happy to help you get started. Youth/Masters (Mixed Age) – At least one male member of the team must be under age 16 or at least 50 years old. Age is determined by the competitor’s age on January 1, 2015. A brief awards ceremony will be held for each event as soon as results are tallied, approximately one-half hour after the conclusion of each event. The event center will be located near the center of the competition map. The exact location of the assembly area will be announced just prior to the event. Every competitor will receive a map prepared especially for the event; it has a scale of 1:25,000 (foot) / 1:30,000 (bike). Every team will need one EMIT electronic timing card, as used by competitors at Israel Sport Orienteering Association events. The organizers will loan an electronic card to any team in need of one. Every team must carry a mobile phone, well charged at the start, whose number has been registered with the event organizers. Every competitor in all events must be carrying at least 2.0 liter of water at the start of the event. Locations where drinking water is available will be marked on the map. During the competition, competitors may use only the food and equipment which they have carried from the start, or have left at the assembly area for later retrieval. No provisions may be cached in advance of the event. Only water may be refilled at any of the water stations spread throughout the rogaine area. 30-40 checkpoints will be spread across the rogaine area. Checkpoints are marked by orange and white flags (orienteering control markers). Every checkpoint has an electronic timing device with a unique code. Each checkpoint has a numeric code, which is also its point value. This number appears on the map and on the checkpoint itself. Each checkpoint in the field is also marked by a streamer (flagging tape) labeled with the checkpoint number. Typically the streamer will be visible from a distance while the checkpoint control flag will be slightly hidden (behind a bush or tree) to reduce the chance of theft. Each team’s score is determined by the total value of the checkpoints visited. Points are deducted for being overtime, according to a rate per minute or part thereof. Teams finishing more than thirty minutes late will be considered overtime, and therefore disqualified. The rules for the event are based on the international rogaining rules. In case of discrepancies between those rules and those defined by the organizers of Israel Rogaine 2015, the rules for this event will be the operative ones. 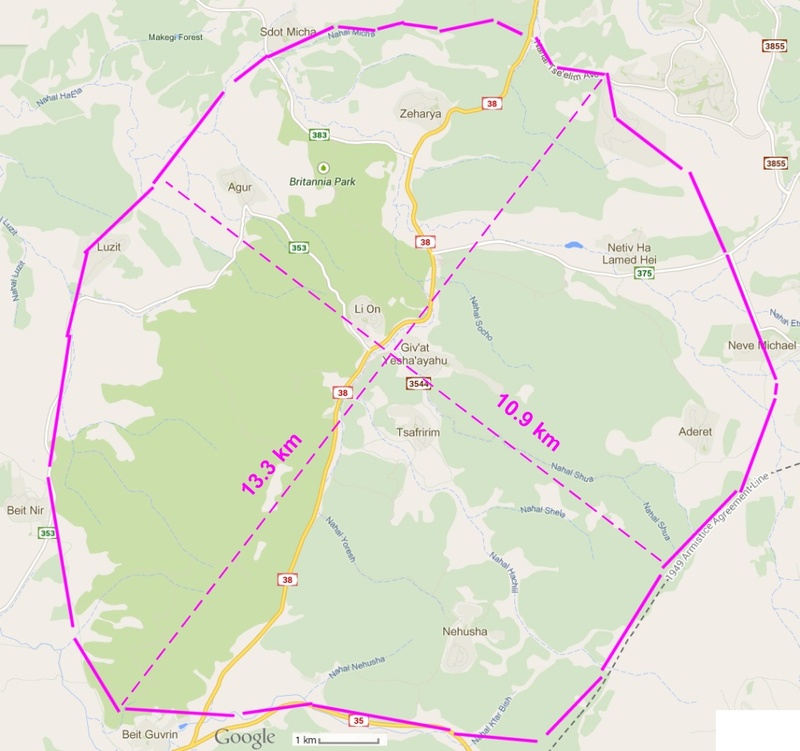 The rogaine map spans both the Adullam and British (Britannia) National Parks in the southern foothills of Jerusalem, south of Beit Shemesh. Directional signs will be posted on Route 38. If you would like to participate but don’t have a partner, use the Find-A-Teammate form on the rogaine (Hebrew) website, or post to the Rogaine Facebook (English or Hebrew) event page. Specify your level of fitness, the category you want to compete in, your ambition (e.g., just for fun, aiming for the podium), and your name and contact details of course. Online registration on the Israel Sport Orienteering Association website (in Hebrew). Registration ends 21 March 2015 at 23:59.